Cam and I took off for Texas last week to visit AMVT, a company that sells optical sorter machines. People’s eyes start to glaze over when I start talking about optical sorters until I mention that it could greatly improve the quality of our chocolate and decrease the amount of time it takes to prep beans before we roast them (maybe about half snap back to attention—and 100% of the Dandelion production team!). Imagine a world where a machine with six eyes and a thousand lights is scanning the beans, rejecting anything cracked, moldy, flat, or foreign material. Then a chocolate maker can make sure nothing slips through rather than spending 20-30min per 5 kilos of beans like we do now (keep in mind batches are 30 kilos each and we are prepping roughly 65 kilos of beans per day). As a person hand sorts beans in the chilly bean room, attention can wander, and we miss things that a machine will be able to catch. 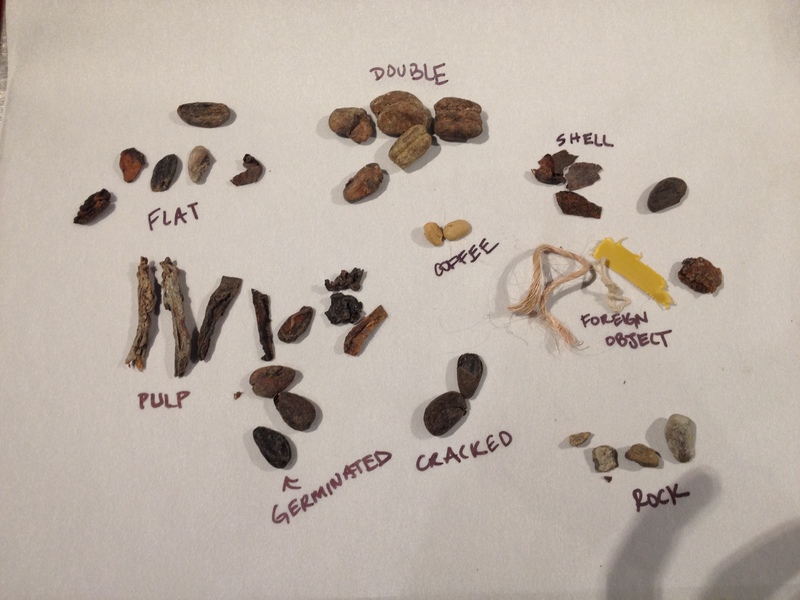 This can help us make better chocolate by selecting only the best beans! We flew into Austin and stopped by La Barbecue to fuel up for the drive to Houston. We made it just in the nick of time to be their last late, late lunch customers of the day and got to sample some mighty fine brisket and pulled pork. It came with the most amazing sweet and tangy sauce and was just the ticket to kick off our Texas adventure. 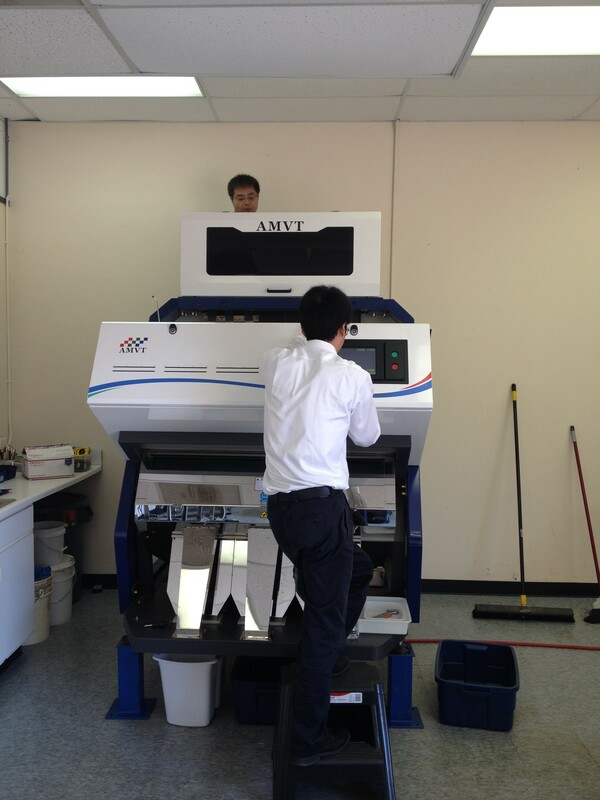 The AMVT lab had several machines and we were warmly welcomed by David and his colleague, Gary. There were several tests to try and we had brought an overweight checked bag (shh!) full of raw beans from a two different origins to play with. David and Gary had calibrated the machine with a previous sample we had sent. We worked with them to understand the priorities around rejecting beans based on color, size, and shape. The machine has a set of cameras facing each other (so it can “see” both sides of the beans) and is fed from the top using gravity and slight vibration to move the beans down. The beans fall past the camera and then, if rejected, are blown into a different chute with compressed air. All simple in concept, complicated to achieve, and amazing to see in action. David and Gary were incredibly knowledgeable and helpful and we both learned a lot during our visit. On our way out of town, we decided we needed one last barbecue fix before heading back to SF. 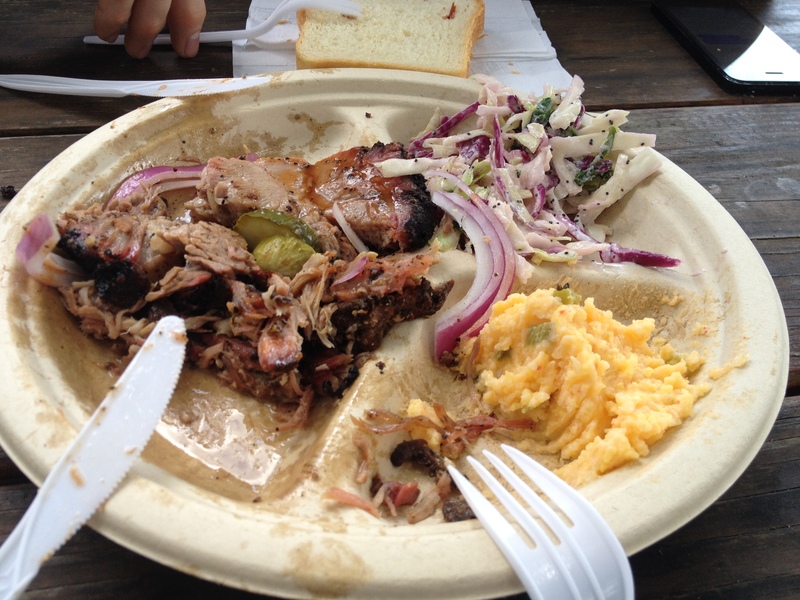 We hit up Micklethwait Meat Company where we tried their pulled pork, pork shoulder, and brisket. These were accompanied by outstanding homemade pickles, jalepeño cheesy grits, and crisp coleslaw. The meat was delicious and the grits were amazing! To top it all off, we stopped by Hay Elotes, a permanent structure version of a Mexican street cart selling all things corn and delicious ice cream/icees. 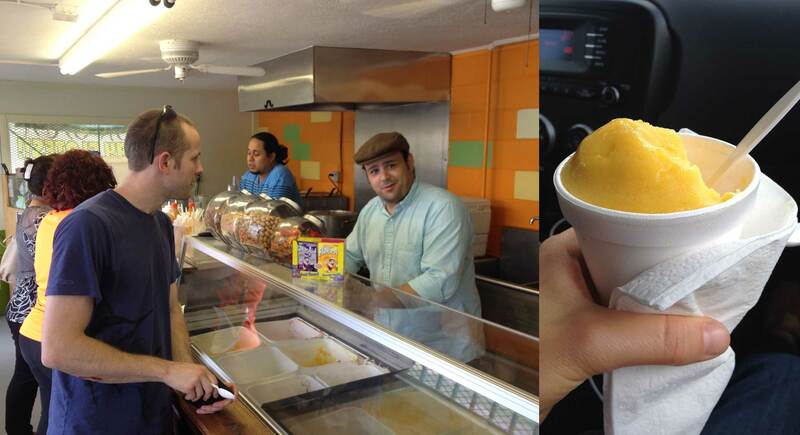 Ivan helped us out and let us sample a few things and explained how they seek out the best corn in Mexico to import. He told us, “in Mexico, corn is life.” We were too full to sample the corn or the chicharones, but we both enjoyed mango, lime, and tamarind icees (kind of like sorbet). Ivan promised to come visit the factory next time he’s in SF. All in all, a productive and illuminating trip to learn about some pretty amazing technology. Though we are still in the research phase, we are excited about the possibility of integrating this machine into our process. Delightful account of your great mechanical adventure to darkest Texas, and yes the barbecue there is excellent….the only thing i miss about my native state. I’m hoping that the optical sorter is positioned so that it can be seen from the viewers gallery, as i’m bringing a visiting Texas cousin there tomorrow.